​Michigan native Rachel Childers has been a member of the Boston Symphony Orchestra since 2011. As Second Horn of the BSO, she occupies the John P. II and Nancy S. Eustis chair. She is notably the first female member of the Boston Symphony brass section. Prior to moving to Boston, Ms. Childers was the Acting Assistant Principal/Utility Horn of the Colorado Symphony Orchestra. She also held several positions in orchestras throughout California, affectionately referred to as the Freeway Philharmonic. Rachel holds the distinction of being in the first class of admitted horn players to the Colburn School, in Los Angeles, where she studied with David Jolley and David Krehbiel. Rachel received her bachelor's and master's degrees at the University of Michigan, where she studied with Søren Hermansson. During her time at U of M she enjoyed performing with both the Symphony Orchestra and the Symphony Band, where she began her college career as Horn 4B under director H. Robert Reynolds. Ms. Childers is devoted to education initiatives in her community. Her interest in this work began when she was a teaching artist for the Los Angeles Philharmonic, where she was partnered with underserved schools in the Los Angeles area. She continues this line of work with the Boston Symphony Orchestra’s Education Department. She is particularly proud of her involvement in the implementation of the “BSO In Residence” project; an initiative directed at her adopted community of Jamaica Plain, MA. Ms. Childers also develops and performs programs for the BSO’s “Concerts for Very Young People” at local libraries and children’s museums. While working towards her Artist Diploma at the Colburn School, Rachel was a researcher in the Academic Development and Institutional Research Department at the Fashion Institute of Design and Merchandising in Los Angeles, CA. Initially a data-entry clerk, Ms. Childers discovered a talent for statistical research and analysis. During her 4 years at FIDM she was promoted into what could have been a promising career. This interest in data analysis continues in Boston, where she serves on the supervisory committee of the Symphony Credit Union and on the Pension Board of the BSO where she digs deep into quarterly reports. ​Currently on faculty at the New England Conservatory of Music, Rachel has also taught at Boston University and has presented masterclasses at the Manhattan School, Mannes School of Music, the University of Michigan, Colburn School, and Boston Conservatory. In 2014, she was a featured artist at the Southeast Horn Workshop at the University of North Carolina at Greensboro and a visiting artist at the University of Montana. Ms. Childers has taught at the Tanglewood Music Center, Boston University Tanglewood Institute, and Bar Harbor Brass Week. She and her husband Sam, a bassoonist, have two lovely children with great pitch and volume. Martin Hackleman recently joined the faculty of the University of Missouri-Kansas City Conservatory of Music and Dance as Artist in Residence and Associate Teaching Professor of Horn in the Fall of 2012. Mr. Hackleman began playing the horn at the age of sixteen, studying with Caesar LaMonaca in Houston. Other teachers have included Barry Tuckwell and Roland Berger (Vienna Philharmonic). He studied at the University of Houston and at age 19 he won the Principal Horn Chair in the Calgary Philharmonic where he played for two seasons. He then joined the Vancouver Symphony as Solo Horn under Maestro Kazuyoshi Akiyama in 1974 where he played for the next nine years. In 1983, Mr. Hackleman left Vancouver to join the world-renowned Canadian Brass. His three years with the group saw many outstanding achievements, among them: seven recordings for CBS Masterworks, including Brass in Berlin (with the brass section of the Berlin Philharmonic); extensive tours of the U.S., Canada, Europe and the Far East; a Canadian JUNO award for "best classical record"; the group's Hollywood Bowl premiere; and the release of their first video. Mr. Hackleman then accepted an invitation to join the Empire Brass Quintet, whose moderate concert schedule allowed him time to pursue a solo career as well as specialty interests such as the Vienna and Natural Horns. He was a member of the EBQ for four years and recorded 5 CD’s with them. ​No stranger to the field of music education, Martin has published two étude books with BIM in Switzerland (now in their fifth printing) for the horn that are required repertoire at such institutions as the Royal Conservatory in London, England and the University of Michigan. He is a frequent juror for the Canada Council. He has been on the faculty at the University of Maryland, Boston University, and the University of British Columbia. He is on the faculty at Banff Centre in Alberta every summer in the Brass Program as well as a frequent guest in the Chamber Music Sessions. For four years he coached the Asian Youth Orchestra and participated in their annual world tours. Mr. Hackleman is a member of Summit Brass where he plays, records, and teaches every summer. Over the years he has been invited to give master classes at Julliard, the Manhattan School, Curtis Institute, and UCLA, among others. For many years he was a French horn design consultant with Yamaha. Martin returned to Vancouver in November of 1989, where he played Principal Horn in the Vancouver Symphony Orchestra once again served as Adjunct Professor of Horn at the University of British Columbia. In 1990, He helped launch a nationally broadcast chamber music series on CBC Radio called "CURIO", featuring chamber music of rare combinations and forgotten composers. For the 1999-2000 season Mr. Hackleman was invited to play Principal Horn in the Montréal Symphony under Charles Dutoit. In 2000, he was appointed Principal Horn of the National Symphony at the Kennedy Center in Washington, D.C where he remained for 12 years until his move to Kansas City. He was asked to perform as a guest Principal Horn with the Philadelphia Orchestra on two occasions while living in Washington, D.C. As well, Martin has played Principal Horn in the Chautauqua Orchestra at The Chautauqua Institute and at the Waterloo Festival in Princeton, New York for a number of seasons. Martin plays Solo Horn regularly in the Washington Symphonic Brass and has recorded four CDs with them. He also teaches at The Banff Centre in Banff, Alberta, Canada with the All Star Brass, a team of renowned brass soloists led by international trumpet soloist Jens Lindemann. They will be releasing their fourth CD in the spring of 2013. As well, Mr Hackleman is a regular member of Summit Brass and performs and teaches with them every summer in Denver at the Rafael Mendez Brass Institute. Mr. Hackleman has made numerous recordings with the National Symphony, Vancouver Symphony, Montreal Symphony, Canadian Brass, Tidewater Brass, and the Empire Brass. In 1997 he recorded his first solo CD, After a Dream, made up entirely of his own arrangements for solo horn with piano and string accompaniment. He then recorded Romanza with the CBC Vancouver Orchestra which featured 5 lost Romantic concertos. In addition, a recording of chamber music for 2 horns and bassoon was released in the spring of 1996. In November of 1998 a Christmas recording with horn quartet was released. A disc of the Brahms Horn Trio with other chamber music was released in July of 2000. His most recent CD is a duo collaboration with his wife, Kelly, entitled, Solitary Hotel, which includes the works of Massenet, Rheinberger, Hlobil, Barber, and Wilder. Since 1998, The Four Hornsmen of the Apocalypse have captivated audiences with their stellar musicianship and comical repartee. They pride themselves in their ability to connect with the audience and break down the traditional barrier between the performers and the listeners. Over the years, the Hornsmen (yes, they are aware there is a lady among them) have performed throughout the world with symphonies, on college campuses, at horn workshops, churches, arts festivals, public schools, public restrooms, parking lots and highway rest areas. They have been selected as guest artists at several International Horn Symposiums, served residencies at the Chopin Conservatory in Warsaw, Poland and the Conservatorio della Svizzera Italiana in Lugano, Switzerland and toured South Korea, where they performed with the Shanghai Philharmonic at the Busan Maru International Music Festival. Aside from their numerous awards and honors, the group is best known for their unique live performances. 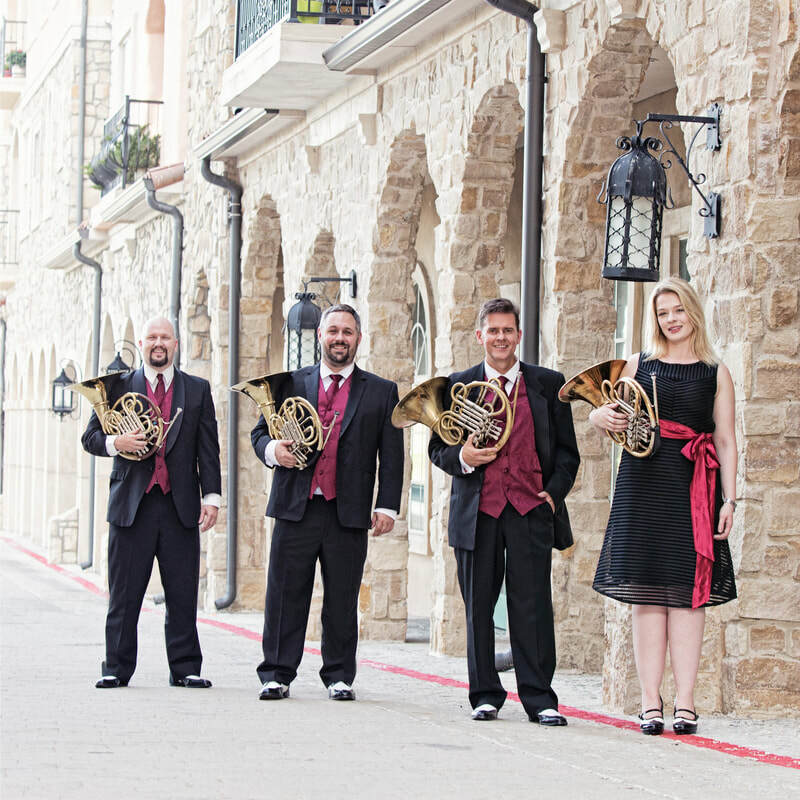 Concerts balance traditional quartet repertoire and music that can only be described as "theatrical horn stunts." They also continue to expand the horn quartet literature with newly commissioned works. The Hornsmen not only entertain, but also educate. Regular tours are not just performances but include masterclasses, individual lessons and side-by-side performing with students. Their "laid-back" and approachable style allows horn players of all ages and abilities a great opportunity to learn from some of the best in the field. ​Jacquelyn Adams “not only has a career that covers the regular time-honored horn player pursuits - orchestra playing, university teaching, and freelancing - but she has other creative visions and abilities that are rare by themselves and practically unheard of in a professional horn player" (The Horn Call, Feb 2015). Jacquelyn is principal horn with the Pensacola Symphony, Meridian Symphony, and the Gulf Coast Symphony; she is also third horn with the Mobile Symphony. She has performed as a featured soloist at Canada’s Sixth International Horn Day, Cusco Music Festival, Meridian Symphony, and The Mobile Youth Orchestra. Jacquelyn has premiered multiple works for horn including her self-commissioned concerto “Radiant Dances” for horn and string orchestra by James Naigus. Recordings include Genghis Barbie’s self-titled debut album, David Byrne and St. Vincent’s Love This Giant, Astor Piazzolla’s Oblivion, Aaron Copland’s Clarinet Concerto with grammy-nominated ensemble A Far Cry, and she has recorded numerous times for NFL Films. Television and movie appearances include CBS’s The Early Show, Disney’s Step Up 3D, and BET’s Music Awards 2007. Jacquelyn is the Assistant Professor of Horn at The University of Southern Mississippi and holds performance degrees from The Curtis Institute of Music, Yale University, and University of New York at Stony Brook. Brian Brown is the newest member of the Hornsmen (2015). He is an active freelance horn player in the DFW area. He serves as Principal Horn of the East Texas Symphony, and performs regularly with the Fort Worth, Plano, and Waco symphonies, the Dallas Opera, and the Dallas Wind Symphony. Additionally, he has performed in many productions with Dallas Summer Musicals and Casa Manana Theatre, and in numerous recording sessions and chamber ensembles. In addition to maintaining a diverse performing career, he also publishes custom brass arrangements as co-owner of BrownWood Publishing. Brian studied with Dr. William Scharnberg at the University of North Texas. Gerald "Gerry" Wood is currently Third Horn in the Dallas Opera Orchestra in addition to being a frequent utility player for both the Dallas and Fort Worth Symphonies. In the Fall of 2011 he was appointed as Adjunct Instructor of Horn at the University of Texas Arlington. Gerry holds a Bachelor's degree in Music Education (Stephen F. Austin State University), a Masters in Horn Performance (University of Southern Mississippi) and is currently ABD in a Doctorate of Musical Arts in Horn Performance (University of Illinois Champaign-Urbana). His playing experience runs the gamut of performance ensembles. You name it, he's probably played it. He has marched with The Cavalier Drum and Bugle Corps, played in numerous regional orchestras and nationally renowned chamber ensembles, including the American Wind Symphony Orchestra. He is a very busy guy with regular engagements with the Dallas Symphony, the Fort Worth Symphony, the Dallas Wind Symphony, Plano Symphony Orchestra, Las Colinas Symphony Orchestra and many more. Gerry hasn't had hair on his head since he was twenty or so and, don't worry, his kids don't find him funny either!